 It’s time to get started with the Microsoft Graph Security Hackathon! Once you have officially registered (if you haven’t done so already) we’ll be sending you regular updates throughout the competition. Submissions are due March 1, 2019 at 5:00pm ET. Register your application. Even though you most likely do not have your application built yet, you will need to set up your draft app with Azure AD for Graph access. Admin consent will be approved based on the application ID you have shared via the form. Follow at least one of the below steps for Graph Security and Graph entities, if you do not have access to these services already. Fill the form. You will need to fill this form in order to record your option of whether you are using pre-built data or building your own data and share your application ID and Azure Active Directory ID / tenant ID (as applicable) with us. Find inspiration. Need some ideas for what to build? Visit the Inspiration page to get started. Get a head start on your submission. Fill out the basic fields on the application form and familiarize yourself with the submission requirements. This will give you a good idea of what you'll need to put together. Remember: you can edit your submission as many times as you like before the deadline. Optional: Form a team. Thinking about buddying up? Visit the participants page to find and meet teammates. You can see who else is looking for a teammate, check out what’s in their portfolio, and send them a message to connect.